Click HERE to watch the slideshow of this cake! Back in December, my aunt asked me if I could make a cake for a high school reunion that she was putting together. It was a 1950’s themed party for the classes of 1965-1970, and I was happy to do it. At first, the cake was going to be kept simple…a guitar cake on top of a half sheet cake, but plans changed. As I was doing more research on cakes with this theme, so many ideas kept popping up that were just too cute not to do, and my creatively obsessive mind started to go into overdrive. 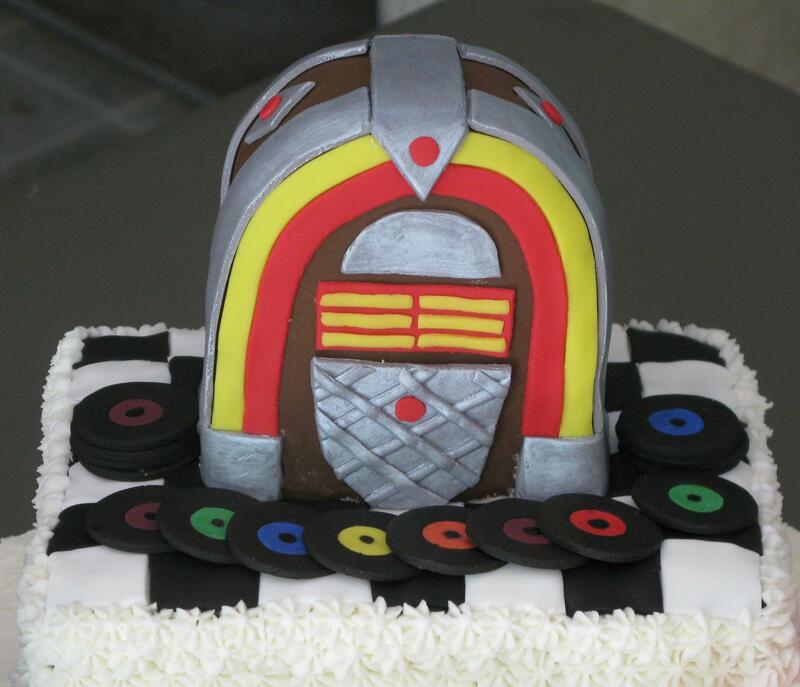 I decided to go with a juke box as the main cake topper. This was the most detailed part of the cake. I used rice krispie treats (storebought kind) as the base of the juke box, packed them all together in the shape that I wanted, then covered them with icing and placed the fondant over it. In all honesty, I’m not really experienced with fondant, so I still struggle with getting it to be perfectly smooth when covering a cake or topper that I make. The juke box ended up having a lot of imperfections. When my neighbor came over to exercise with me, I showed it to her and mentioned about how the imperfections along the sides where I couldn’t get the fondant totally smooth (I think it wasn’t a thin enough layer when I put it over the rice krispie treats). She suggested adding more details, so that’s when I covered it more with the silver. The fondant is gray, and I painted it with an edible, silver paint to give it more of a shimmery look. I was happy with the end result, and most of the imperfections were covered up by the other details. Success! The records are made out of fondant. I made those several days beforehand, so they could dry out and become hard instead of soft, making them easier to position on the cake. The black and white checkered floor is fondant, cut into squares and then placed on the cake. I also premade the food. I called my parents and asked what some popular foods were back then, along with looking at some stuff online. 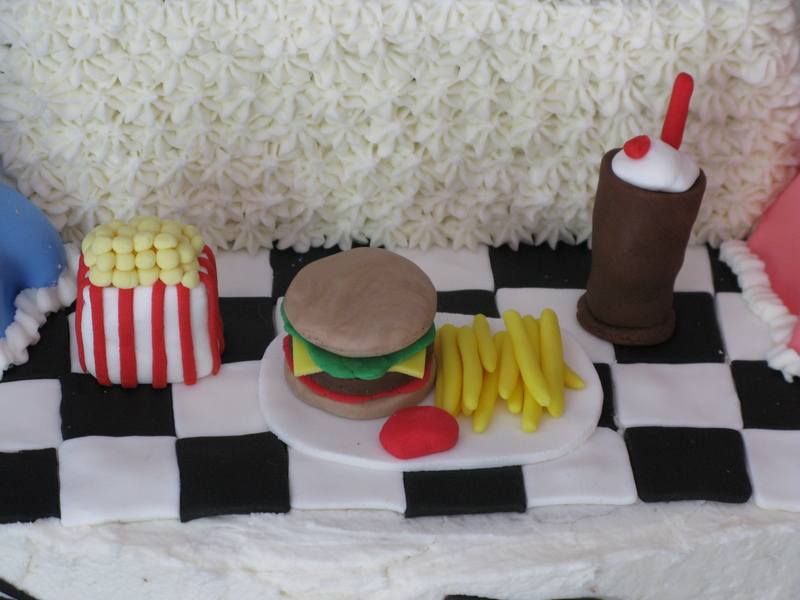 On this cake, we have popcorn, cheeseburger with french fries, root beer float, strawberry milkshake, and a hot dog. These were all made out of fondant several days before the cake was put together. 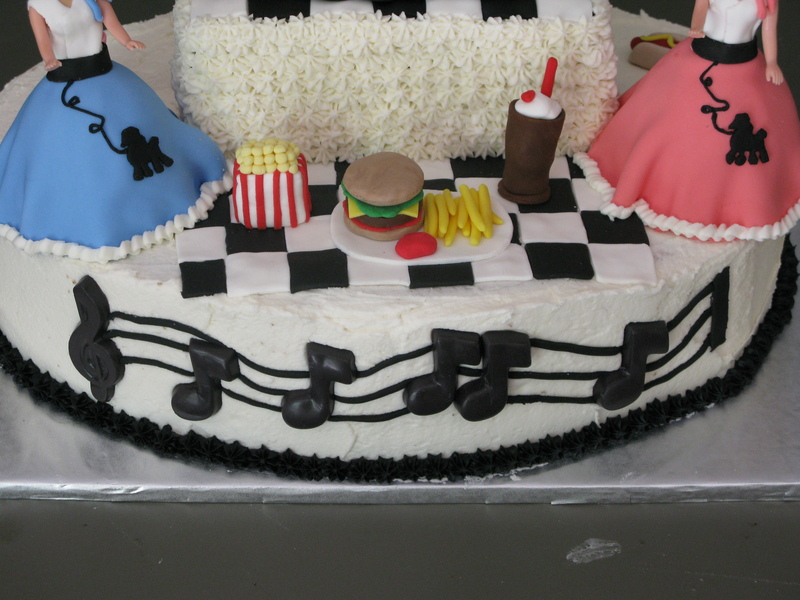 It can’t be a rockin’ and rollin’ cake without music! The notes are made out of chocolate. Yes, chocolate. Melt some black chocolate wafers and put them in a chocolate mold, let them set in the refrigerator or freezer to harden. The black lines are made out of fondant that I placed on the cake before pressing the notes into it. Mini doll cake! I made two of these to sit on either side of the cake. The dress is made out of cake that was baked in a mini doll pan, with the doll cake pick. I put the icing over the mini cake, covered it in fondant, then put the doll pick on top. Using a stencil that I printed out from the internet, I cut out the outline of the poodle and attached it to the skirt with icing, and the black leash is icing. The end result! The bottom tier is a vanilla cake with mini chocolate chips and chocolate filling in between the two layers. The top tier is dark chocolate cake with peanut butter chips and chocolate filling in between the two layers. The cake was a hit!